With Department of Homeland Security secretary Kirstjen Nielsen leaving the White House administration, President Donald Trump announced on Sunday that he has appointed Kevin McAleenan to serve as Acting DHS secretary. McAleenan, who currently serves as the commissioner for U.S. Customs and Border Protection, is CBP’s top border security official and was sworn in on March 20, 2018, after serving as Acting Commissioner for CBP since January 2017. He has been working with CBP since 2006 when he worked as the Area Port Director of Los Angeles International Airport. McAleenan studied law at the University of Chicago and practiced in Los Angeles from 1998 to 2001 before joining the FBI following the September 11, 2001 terrorist attacks. In 2015, he was awarded the Presidential Rank Award, the highest honor given for civil service. McAleenan’s confirmation as CBP chief drew support from Democrats and Republicans, including former-President Barack Obama’s DHS Secretary Jeh Johnson and deputy secretary Alejandro Mayorkas. “Each of us has worked directly with Mr. McAleenan and can personally attest to his honesty, integrity, patriotism, and commitment to the homeland security mission and to the security of the United States,” a letter from eight Homeland Security officials from Obama’s administration and nine others from the administration of former-President George W. Bush, ABC News reported. “In these critical national security roles, Mr. McAleenan has led [the agency’s] efforts to secure our borders … in pursuit of [its] priority mission to prevent terrorists and terrorist weapons from entering the United States. He has also developed and implemented innovations that have facilitated the U.S. international arrival and departure process, both improving our security and making [the border protection agency] more efficient – and in the process saving the government and travel industry millions of dollars,” the letter read. McAleenan has also been critical of some of the immigration policies pushed by the Trump administration. In an August 2018 interview with The New York Times, he called for sanctions for individuals who illegally enter the country but also called for a “better system” to allow families who cross the border illegally to remain together. “To continue to enforce the law, there should be a sanction for crossing the border illegally. It’s not a victimless crime. Not only are the people at risk, so are our agents who need to apprehend or rescue them. It’s also a diversionary tactic for smugglers who use family groups to tie down our agents while drugs are moved behind them. A better system would allow us to keep families together for the entirety of the immigration proceeding, which takes an average of 45 days,” McAleenan said. 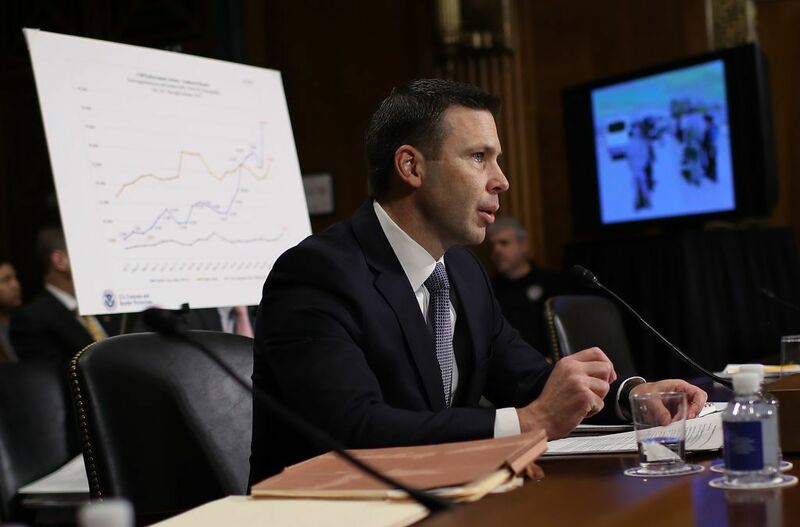 In March, McAleenan warned that Customs and Border Protection was at a breaking point after CBP agents apprehended over 12,000 migrants in two days. “CBP is facing an unprecedented humanitarian and border security crisis all along our Southwest Border — and nowhere has that crisis manifested more acutely than here in El Paso,” McAleenan said in a press conference according to the El Paso Times.